Give the Gift of Massage this Valentine’s Day! Show loved ones you have a stake in their health and wellness by giving the gift of massage this Valentine’s Day. Massage therapy can relieve stress, aid in pain relief and improve mood during the winter months. AMTA member profiles display whether or not they offer gift certificates. Are you a massage therapist? 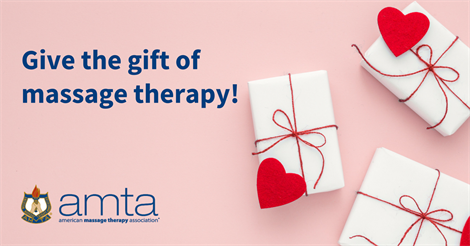 Learn how to get listed or update your profile on FindaMassageTherapist.org, and download a free AMTA member gift certificate template!